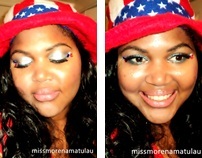 Bella Mia Blogs: Be a 4th of July Cutie Pie! 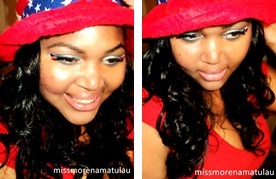 Here is the second American Independence Day look that I promised to deliver to you :) I'm absolutely flattered that you all requested a second video to go along with this special celebration in USA history! The jewel placement in this look is similar to that of my St. Patrick's Day Pot of Gold eyes. Missed the video? 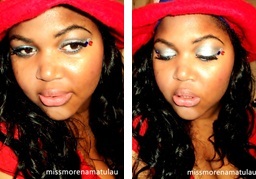 No worries love you can view my very first holiday themed tutorial right here! I hate to break my promises, but I have to confess! : I am HORRIBLE at hair styling! So I was a lil over excited when I told you guys I'd show you what I was doing with my hair for Independence Day. I tried out my idea and it was a total, complete, undoubted epic FAIL!!! See more funny fails and epic triumphs! I'll be capturing all of the holiday memories for us to share, so be sure to check out my vlog channel, so you don't miss out on the fourth of july fun! Have a safe and Happy Fantastic Fourth everyone!!! NYX Jumbo Eye Pencil in "Pots and Pans"
Jessie's Girl Kohl Glitter Liner in "Blue Leopard"
Cover Girl Lash Blast Mascara in "Brownish Black"
Cover Girl tru blend pressed powder in "translucent tawny"
ELF Tinted Moisturizer in "Spice"
Cover Girl Lip slicks in "Princess"